According to the latest data from the Australian Communications and Media Authority (ACMA), 5.2 million adult Australians are now mobile-only users, with no fixed-line telephone at home. This trend is not confined to our cities, as regional consumers are increasingly relying on their mobiles, too. 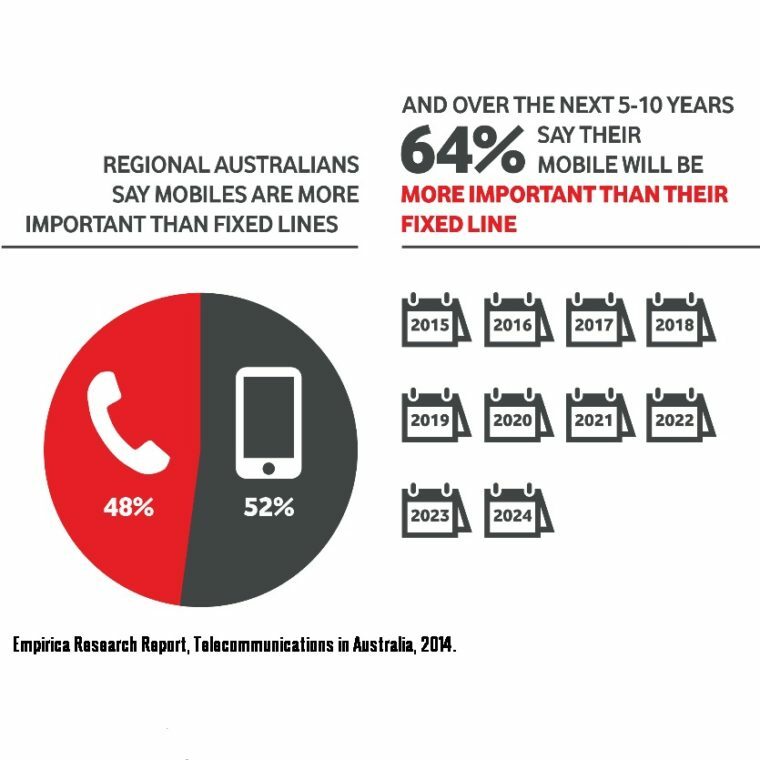 In response to this change in consumer behaviour, Vodafone is investing in regional communities. We’re opening new stores and expanding our mobile network. We are building new mobile towers in regional Australia, 75 of which are part the Australian Government’s Mobile Black Spot Program. The costs of mobile network deployment are very high in regional areas. When we construct mobile towers, we need to connect these towers via transmission links to our network to enable our customers to connect to the internet and make calls. This transmission network largely consists of underground fibre optic cables running for vast distances from mobile towers back to various hubs across Australia. Telstra, as the legacy provider of telecommunications in regional Australia, has existing transmission links to almost every town in Australia. Much of this transmission network was constructed with taxpayer funds when it was a government-owned corporation. It was built to support fixed line services and incrementally expanded to support mobile services as technology and consumer preferences evolved. In many regional areas the cost of connecting to this network represents the biggest proportion of operating costs for Vodafone and other mobile operators. For a long time, we have been charged very high rates to lease this transmission. Encouragingly, the Australian Competition and Consumer Commission (ACCC) has reduced average prices for long distance, high capacity transmission services in regional areas by 78 percent. The NBN has also come to the party in recent times by offering its fibre optic network for lease to mobile operators who wish to access it to connect their mobile towers in regional areas. In addition to these arrangements, the Australian Government’s Mobile Black Spot Program opens many doors to better outcomes in regional Australia. It ensures public money is spent wisely and responsibly by encouraging co-investment in mobile network infrastructure by all providers and delivering choice to customers. The sharing of network infrastructure by mobile carriers reduces roll-out costs, and in many regional and remote areas this cost saving may be the difference between mobile operators being able to invest in new mobile towers or not. There are many benefits to be gained from the greater sharing of mobile network infrastructure. Indeed, it is in Vodafone’s international experience that mobile network infrastructure sharing in regional areas is increasingly the norm rather than the exception. Given Australia’s large land mass and relatively low population density, in many places it makes sense to build only one mobile network. Despite this, we see some of the lowest levels of mobile network infrastructure sharing in the world. Co-location or ‘passive’ sharing refers to the practice of sharing mobile network infrastructure by multiple operators. Typically, this involves sharing transmission, power and towers with each operator installing their own antennas and electronic equipment. Mobile operators can also opt for a more ‘active’ sharing arrangement by jointly investing in and sharing antennas, electronic equipment and even spectrum. As well as commercially driven infrastructure sharing, many government regional telecommunications programs around the world provide incentives to share infrastructure rather that duplicate it. Domestic mobile network roaming is common practice in many countries including New Zealand, South Africa, the United States, Canada, and Spain, but with some exceptions, this is not the norm in Australia. Just as many mobile customers enjoy the convenience of using their mobile when travelling overseas by roaming on other networks, Australians could also enjoy the same benefits when travelling within Australia. Regional stakeholders including the National Farmers Federation, NSW Farmers, Victorian Farmers Federation and the Broadband for the Bush Alliance have added to recent discussions about the potential benefits of domestic roaming by the Regional Telecommunications Review Committee, Infrastructure Australia and the Parliament of Australia House of Representatives Agriculture Committee. National roaming is regulated in the other western economies with large land masses and areas of low population density (the USA, Canada and New Zealand). There is no evidence from any of those countries that mandated national roaming has a negative impact on investment. On the contrary, it sees mobile network operators contribute to and subsidise increased investment in regional areas through payments for roaming. Greater mobile network sharing and roaming, particularly in a market and geography like Australia, are likely to result in long term positive outcomes for consumers. This is because costs are reduced as investments are shared which in turn increases the economic viability of regional network expansion. It also means that consumers receive the benefits of choice as multiple mobile operators can compete on the basis of one mobile network infrastructure in many regional and remote areas. In fact, this single infrastructure network approach is the basis upon which the NBN will deliver fixed broadband access to all Australian premises by 2020. Regional Australia is being held back by a lack of efficient collaboration and the unnecessary duplication of mobile network infrastructure. There have been a number of positive developments recently with the Mobile Black Spot Program, the ACCC’s reduction of regional transmission service prices and the Productivity Commission’s review of the Universal Service Obligation. The regulation of domestic roaming would improve regional mobile competition and deliver a better outcome for consumers.